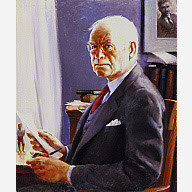 This painting of Edgar Lee Masters is in the National Portrait Gallery. Note how he adds a depth to the painting with objects in the background. Among them are the picture within the painting and figure on the desk that add interesting visual elements. The strong back lighting of the sitter is unusual and makes for a striking image that is softened to a degree by the muted blue tones in the background. The painting was executed in 1946, but entered the Gallery's collection in 1967. The September 1967 edition of the Sigma Phi Epsilon Journal published the following blurb about it. long friend of the artist..
long friend of the artist. Perhaps they met in the latter part of Lee's life when he was living in Melrose (Park) Pennsylvania. That town is only 5 miles from Abington where Quirk taught at Ogontz College. 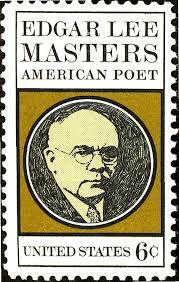 Edgar Lee Masters (August 23, 1868 – March 5, 1950) was an American attorney, poet, biographer, and dramatist. He is the author of Spoon River Anthology, The New Star Chamber and Other Essays, Songs and Satires, The Great Valley, The Serpent in the Wilderness An Obscure Tale, The Spleen, Mark Twain: A Portrait, Lincoln: The Man, and Illinois Poems. In all, Masters published twelve plays, twenty-one books of poetry, six novels and six biographies, including those of Abraham Lincoln, Mark Twain, Vachel Lindsay, and Walt Whitman. He was honored with a stamp by the US Postal Service in 1970.